Yesterday I wrote about the break that introduced me to the New York audiobook scene of the late 1990's and early 2000's. This was a rarified world that thrived on lavish production budgets and the high profit margins afforded by the burgeoning market for retail audiobooks. Production was largely outsourced to audio producers, who hired directors, who in turn hired the studios and the talent. It wasn't unusual for a publisher to drop upwards of $30,000 on production for a best-selling title. Sadly, those glittering days are now behind us as the demand for hard goods (with their juicy profit margins) subsides and downloads become the norm. But they provided some great opportunities for me, a lowly little "home narrator" with a knack for efficiency and a lack of ego issues. Any producer from that era will regale you with stories of the movie star who showed up without a clue as to what the book was about, or the author's preferred celebrity reader who turned out to be dyslexic. I once overheard two producers discussing a very famous actor who had just backed out of an audiobook gig. The one producer was complaining about having to find another narrator. The other one smiled and said, "You're lucky." While it shouldn't be said that the push for celebrity readers as a means of promoting audiobooks was frivolous or misguided, it definitely created some headaches for conscientious directors and producers. Of course, it also spawned a distinctive class of notable film, stage and television actors who excel as narrators--including Ed Herrmann, Will Patton, Jim Dale, Tim Curry, Jay Sanders, George Guidall and numerous others--and who now constitute the upper firmament of audiobook "stars." But you can imagine the relief of a producer or director who, faced with a hefty history book or modest non-fiction title, could call on the services of an eager bloke like myself who was willing to schlep to the big city and, for a modest fee, knock out a project in record time and without any fuss. 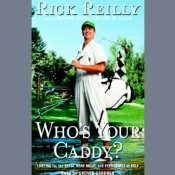 One of the most enjoyable projects I worked on during this period was an abridged version of Who's Your Caddy?, Rick Reilly's hilarious account of his stint caddying for an assortment of professional and celebrity golfers. It's a charming and, at certain points, moving book, well worth a listen even if you aren't a fan of golf. What was odd was that, not long after I got home to D.C., I received a call from Books On Tape asking me if would record the unabridged version of Who's Your Caddy? I said I had just recorded the abridged version in New York, so maybe they wanted someone else to do it. They said no, that was fine, all the better since I'd already passed muster with the author. So I did it again, this time in my home studio, including all the bits that had been left out before. Sometime later I received copies of both versions, and I was curious as to how they might have differed. The abridged version is distinctly more "on"--the energy is higher, reflecting the heightened stakes involved in recording in New York, with a director ogling you through the glass window and a host of producers and editors dodging in and out. The "home" version is more relaxed, but no doubt benefited from the takeaway of the sessions in New York. Frankly, it was pleasant to do it again without the pressure, and be able to include more of the background and setup material. Both versions are on Audible and the curious can listen to the two samples. It's very rare in the audiobook business to have an opportunity for "do-overs." I've had a couple others, maybe I'll write about those in a day or two. Grover Gardner has been narrating audiobooks for nearly 30 years. He has numerous awards and over 800 titles to his credit. He is currently Studio Director for Blackstone Audio in Ashland, Oregon.